and 9 galleries of Tudor treasures. The Mary Rose is the only 16th century warship on display anywhere in the world. The purpose-built award-winning museum reunites her with many of her artefacts and crew, capturing the moment in time when she sank. Step back in time and explore Henry VIIIs favourite warship  raised from the depths of the Solent and painstakingly conserved for future generations. The story of the Mary Rose is one of the most fascinating in naval history. A tale of battles fought against the French for over 30 years before sinking off the coast of Portsmouth in 1545. Its an account of her being raised from the seabed more than 470 years later and of her meticulous conservation. The ship captured the worlds imagination when she was raised from the Solent in 1982. Her dramatic story is now revealed in full inside the purpose-built, award-winning £27million Museum, which opened its doors to visitors in May 2013. "Every time I get up close to the Mary Rose I am overwhelmed at what she represents. Centuries of history, Britain's greatest time capsule, our version of Pompeii" Dan Snow, historian and broadcaster. Be wowed by the stunning panoramic views of the ship from all nine galleries. You will feel like you're stepping on board. Breathe the same air as the King's flagship on the upper deck, with just a balcony separating you from this Tudor masterpiece. Watch the Mary Rose turn into a living ship. Meet the crew in peace time and at war, part of a captivating new experience. In addition to the ship, the collection of artefacts is just as impressive. There are many thousands on display, including personal belongings such as wooden bowls, leather shoes, musical instruments and nit combs, and many of the ships weapons, from longbows to two-tonne guns. 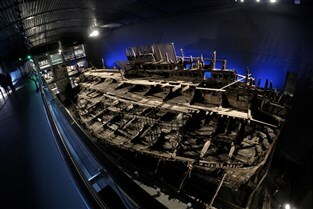 The museum offers a unique insight into the life of crew members too, with forensic science used to bring the story of the Mary Rose and her crew to life. The reopening in July 2016, following a six month closure and a multi-million pound investment, allows visitors to get closer to the Mary Rose than ever before. The new design enables the public to take in the stunning panoramic sights of the ship from all nine galleries through floor-to-ceiling glazing on the lower and main decks- giving, at times, the sensation of walking on board. The new Mary Rose experience includes the use of innovative technology to bring the story of the doomed warship even more to life. Fully immersing visitors in the Mary Roses history, projections onto the hull of the ship, with authentic sound effects and green screen Hollywood magic, shows just what life was like on a busy warship in 1545. Acted by staff and volunteers at the museum, the 66 vignette projections showcase life-sized characters all of whom would have lived on the ship in its heyday. On site facilities include the Mary Rose cafe for light meals and refreshments.